Formed with a single jam on the eerie palindrome of 11/11/11 (also an ambigram by the way), touring circumstances brought together the unholy trinity of Bong’s Mike Vest (guitars/effects) and Ramesses’ Adam Richardson (bass/vocals) and Mark Greening (drums) to form 11Paranoias – a new venture of an equally unwavering and unnatural premise. Before Greening’s recent departure to rejoin Electric Wizard (he’s been replaced by Gareth Brunsden of Lord of Putrefaction, ex-Hexed, ex-Thy Grief Eternal) this super-heavy trio managed to boil their stock down into four hazy, warped jams which are about as far from idyllic as words can send us. Claiming themselves to have quelled their Bong and Ramesses traits into a psychedelic soup equally poisoned by Loop, Hawkwind and Monster Magnet is certainly not far off the mark on this evidence and for fans of either band ‘Superunnatural’ will certainly present a challenging and expansive next step. The first five minutes of ‘Deceiver of the Deep’ could certainly be forgiven for being a Ramesses song that simply wasn’t finished in time. Those languid riffs, Richardson’s grit-blended snarl and Greening’s caveman-speed percussion are all there, but something happens at around that five minute juncture that tells you that Ramesses’ demise has spawned a far more powerful entity. That something is Mike Vest. His layers of guitars are so distorted that they sound like vibrations echoing from a lost satellite between the many orbits of Andromeda. Behind the kit, Greening attempts beats and fills that would have been out of place at best in Ramesses as the pace is gathered and catapulted earthbound through Vest’s untold battery of special effects. ‘Ossuaries’ is a mess; a gloriously unhinged bloodbath of reverberating drums, Richardson’s guttural wretches and unidentifiable, yet grooving, bass patterns. It sounds like an Ouija board abandoned in the fields of Flanders. ‘Reaper’s Ruin’ returns us to the more recognisable pastures of Ramesses’ morbidity, yet against a backdrop of an altogether far more psychological sense of decay. Vest works his magic again by slowing this one down to a broken-limbed crawl with his magic boxes of doom, but yet by the track’s close I can hear more references to free jazz and Krautrock than to heavy metal itself. ‘Inside Eusas Head’ is the last of the album tracks proper and initially leans on the soft, bluesier sides of stoner rock, before metamorphing into blackened Burzum-esque waves of scything electronica. You can see the influences at the beginning here and certainly at the end, but everything in between is definitely not on any musical map that I’ve come across before. That’s your bag for the now out-of-print LP, but the yet-to-be-unleashed CD and digital versions of ‘Superunnatural’ contain four bonus tracks of grainy-quality rehearsal recordings which give valuable insights into the songs’ development. ‘Eusas Ghost Projector’, the former working title of ‘Inside Eusas Head’, is a mammoth 12-minute jam of more violent execution than its end product. Richardson’s bass lines are cleaner and the riffs retain grit and solidity when stripped of Vest’s license to distort. Elsewhere, Greening’s timely might and improvisational skills make this an altogether more hypnotic listen – somewhat akin to Monster Magnet putting their beers and chicks away and playing some Amon Düül II covers. Meanwhile, the demo version of ‘Deceiver of the Deep’ accentuates its tribal drums and forceful riffs slightly better than the directors’ cut does, but yet it lacks the “Ramesses is dead, long live 11Paranoias” undercurrent of the final mix. 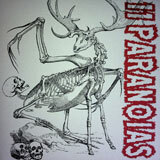 With Ramesses now completely face-down in the lake and bands like Bong on a steep incline towards more universal acclaim on the psyche-rock undercard, 11Paranoias is a fresh start-up with enough pedigree, room to manoeuvre and genuinely fascinating material to appeal to the ear of many diverse listeners. As for 11 herself, she’s wiped clean and replaced the kitchen knife, burned her blood-stained clothes and gone back upstairs to the many dolls and hair accessories her bedroom houses so neatly. Satan’s downstairs, too busy scalding 13’s latest bible-burning exploits to even notice her return. Not even he knows what she’s capable of doing next.